String on top of the head - Art of Posture. Alexander Technique South London. 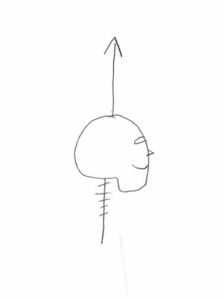 People often think the Alexander Technique is about imagining a string or golden thread coming up from the top of the head. It is certainly useful to think upwards. Much of our attention is downward: reading, typing, texting, cooking, childcare. This can make us slump and this can cause back pain or neck pain. A thread coming up from the top of the head can sometimes make people over stretch their neck. They may also tip the head backwards. And this can bring tension into the body. Backache, whether it’s lower back pain or upper back pain, can happen when we’re trying to do the right thing. But knowing what the right thing is can be tricky. And so the Alexander Technique is useful as it dispels some myths. Think up from your feet all the way to the top of your crown. Think of the space above your head. Imagine your hair sprouting from the top of your head. Imagine bubbles constantly travelling up through your body to the top of your head. Posted in Alexander Technique concepts, Back Pain, Neck Pain, Tension and tagged back pain, neck pain, posture, tension.